This article was written to celebrate Jamaica's 50th Independence Anniversary in 2012. Without the contributions of the island's indigenous Yamaye Taíno, there would be no "Jamaica", a Taíno word derived from their Arawakan language. Although the Taíno were not Jamaica’s first inhabitants, we must honor their contributions to Jamaican culture. Writers often disagree on the name for the island’s earliest residents. Since there are differences of opinion on the name of Jamaica’s first or  "Archaic” people, let’s call the earliest humans who inhabited Jamaica (possibly over 6,000 years ago) the pre-Taíno. These first and later waves of humans to enter the Caribbean seemed to have originated in the mainland Americas (Belize - Central America; Venezuela - South America; Florida - North America). The earliest group may have traveled from a mainland to the island of Jamaica via cays or keys. These small islands were more abundant when the sea level was lowered by captured seawater in the Earth’s then larger, frozen poles. From a European point of view, these “discoverers” were hunter gatherers who may have also practiced agriculture before the Arawakan-speaking, seafaring, agriculturalist Taíno arrived. (Top-L.) Jamaican rock iguana, erroneously thought to be extinct. (Top- R) Sculpture of “Iguanaboina”. The Iguana (the yellow sun) and the Boina, the black raincloud snake. 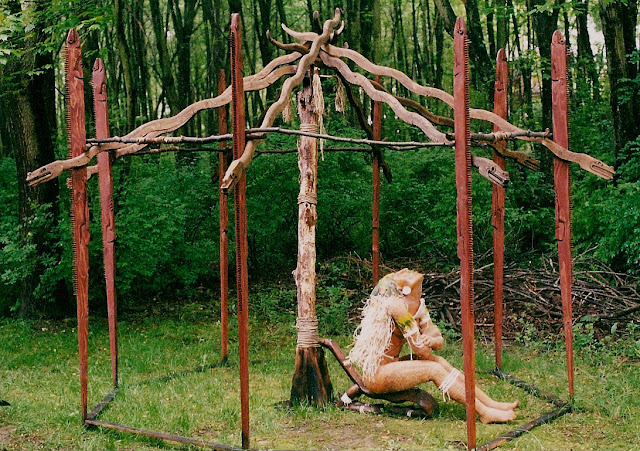 (Bottom) Sculptural installation: “Anacaona” (Golden Flower). 15-16th century cacique (ruler) of over 100 sub-caciques of Ayti (Haiti/Hispaniola) in her bohio (roundhouse) with carvings of iguana and boina centrally supported by the sacred ceiba (cottonwood) three. The gigantic ceiba features prominently in Taino and Jamaican lore (to some folk in Jamaica, duppys/spirits are also associated with ceiba/silk cotton trees). Like the Taino, some Jamaican fishermen still build dugout canoes from this tree. The Taíno were born from a union between one of four “twin” sons, Deminán Caracaracol the scaly one, and a caguama (Turtle Mother) through fertilization of  guanguayo discharged onto Deminán’s back by Bayamanaco, the irate Spirit of the Fire, also the fabricator of casabe (cassava bread) from the poisonous yuca tuber. This story of Deminán and Bayamanaco relate how tropical Amerindians came to learn to use the power of the sun and fire in cooking on a burén (a circular clay grill) to transform the poisonous yuca (bitter cassava) tuber into an edible bread they called casabe. Some of the fruits and vegetables that Jamaicans enjoy and agriculturally profit from were brought to the island by these sets of ancestors. They either brought Mainland plants  (yuca, batata, maisi) or utilized endemic flora and fauna that abounded in Jamaica and which these ancients taught us how to exploit. Some of these products that we casually consider to be real Jamaican are cassava and bammy, corn (ground into meal for making turn-cornmeal, dumplings, pone, dukonoo, pudding, etc), pumpkin, chocho, beans, peppers (or ají as the Taíno called capsicum), sweet potato, yampie,  callaloo and Indian kale (for Taíno “pepperpot”), hog plumb, pawpaw (papaya), pineapple, sweetsop, soursop, custard apple, stinking toe (locust), guinep, guava, naseberry, starapple,  calabash for abortions/containers; woods like mahogany, mahoe, lignumvitae, and much more. The uses of many curative Jamaican bush medicines from endemic herbs are Taíno in origin. When Jamaicans have aphrodisiac Irish moss, medicinal strong back, sersee tea, cold bush, soursop leaf tea, sarsaparilla, chainey root, etc., for health reasons, they are using Taíno remedies. 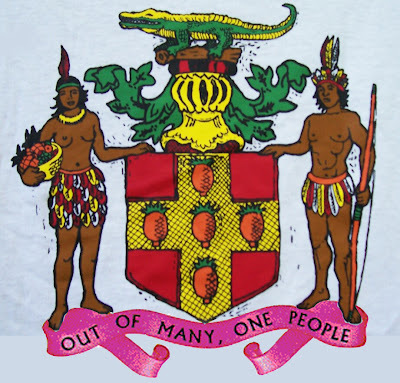 Jamaica’s Coat of Arms honors the Taíno people as the root of our diverse population of today. Jamaica’s proud Taíno Coat of Arms. When you bite into a piece of Jamaican  jerk meat, you are experiencing a Taíno gift that spans millennia. Unknowingly, your taste buds may shout a Jamaican style, “Bowy, dis food cris’!” What you have truly experienced is a gastronomic equivalent of our motto “Out of Many, One People”. You are literally eating a part of the antique history of Yamaye in an ancient and diverse pre-Columbian hemisphere, much later invariably called the “Indies”, the “Antilles”, the “New World” or the “Americas”. The primeval method of grilling that you experience through “jerk” is a Taíno based gift that they called barbecoa. In Jamaica, a barbecoa became “barbecue” a concrete platform on which cacao (chocolate) and coffee beans are sun dried. The Jamaican style of jerk was the Taíno method of spicing agouti/Indian “coney” (“rabbit”) or sacred iguana with Scotch Bonnet pepper and pimento/allspice. This method of preparing and preserving meat was later borrowed by the  Maroons who became masters of jerk pork. It predates the Caribbean’s Pristine Era when nomadic Asiatic humans breached the virginal shoreline past the first trees that the later arriving seafaring Taíno called mangle, the word from which we got mangrove. Taíno watercrafts that arrived onto our shores slithered through a translucent, fish-laden blue-green bagua (sea). It was ruled by, Yúcahu Bagua Máorocote, the life-sustaining deity of the yuca (  cassava) and the sea. He was without grandfathers, being the son of the  virgin mother Attaberia, goddess of fresh water and of childbirth. The Myth of Extinction: Does DNA lie? My training in portraiture and the intimate involvement in the Native American community in the USA for almost 50 years, lead me to the following conclusions. Examine the photographs below. The first two that were taken soon after 1865, exhibit, in my opinion, three distinct facial phenotypes in Jamaica. They are African, European and Amerindian bone structures present among the Maroons and the English officer. The subjects in the more recent photographs (A) & (B), also show evidence of Amerindian admixture. 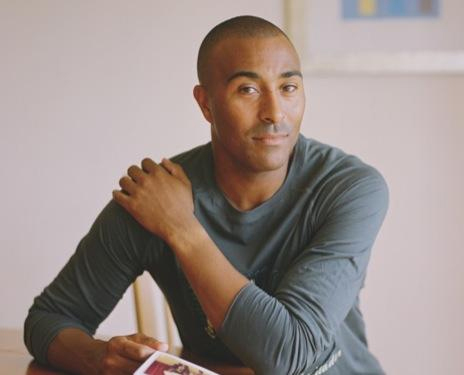 Facial bone structures don’t lie (A): A photograph of Jamaican/Welsh BBC television personality and athlete  Colin Ray Jackson CBE, has 7% Jamaican Taíno DNA. The photograph (B) below is of a Jamaican woman, also with Taino bone structure. (B) Shirley Genus from Treasure Beach (or *Savanna-la-Mar), 1993 by antiquarian Steve Solomon. 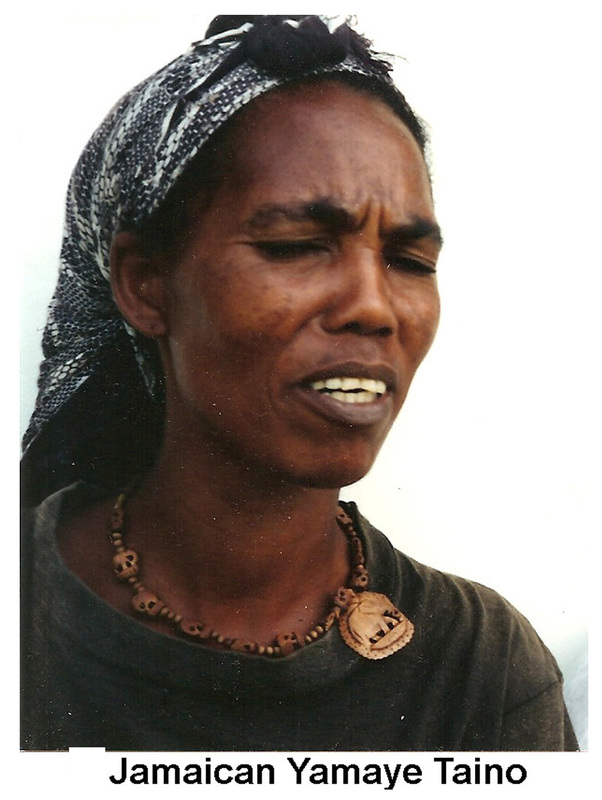 She identified herself as an “Arawak”. It would be interesting to discover if she also had "shovel teeth", an Amerindian dental trait. In 1992, I received an investigative grant on indigenous retentions in the cultures of four Caribbean islands of Jamaica, Puerto Rico, Antigua and Dominica, whose people at that time, like the Jamaican iguana, were supposed to be extinct. I began at the Smithsonian Institution in Washington, DC. That year’s Annual Smithsonian Folklife Festival theme was “Maroons of the Americas.” Maroon societies from Jamaica and Surinam, as well as descendants from Florida’s Seminoles who had fled to Mexico, assembled on the Mall to demonstrate their cultural retentions. Jamaica was represented by Accompong and Mooretown Maroons who demonstrated cooking jerk pork on a wooden grill called a  caban; cordage used for strong rope woven Taíno-style from the inner bark of the Trumpet tree (Cecropia peltata) and  hammock-making from the bark-cord. Its hollow branches were traditionally used to make flutes similar to the “trumpets” that Columbus recorded seeing the Taíno use in Bahía de la Vaca (“Cow Bay”) after his Second 1494 Voyage. Jamaicans learned how to make medicine for both a cold and sore throat from the leaf of the Trumpet tree. In the tradition of other indigenous Americans, the Taíno forest was used as a pharmacy in which one could find chew stick for cleaning the teeth and thirst-quenching  water wiss vine. This survivalist practice was also found among Amazonian Amerindians. The birds that we admire, the foodstuff we eat and our “bush medicine” from endemic plants, originated with the indigenous people who had used them locally for millennia. It is highly unlikely that new 1494 arrivals to Jamaica were instinctively capable of identifying the curative qualities of endemic herbal plants. We are what we eat, so the acquired knowledge of asthma bush, cold bush, bellyache bush and fever bush is part of a cornucopia of natural medicines that have made us more Yamaye than we may suspect. Without the Taíno, we could not celebrate 50 years of independence. This spirit of freedom, first exhibited by the cimarrones Taíno, was passed along to the welcomed runaways who acquired the title “hero” held by Nanny and Cudjoe. Yet, Jamaica has no sculptural monuments to the Taíno. It’s about time we correct this omission of our “First Jamaicans” from our national monuments. The names Igneri, Ciboney, Guanahacabibe (de Las Casas) were invariably used to denote an early people who occupied the islands within the Circum Caribbean. “Meaning 'good' or 'noble', because several of its members spoke that word to Columbus to indicate that they were not Island-Caribs (Alegria 1981)” — Rouse 1992, 5. Cayo, a small island, is the root word for cay or key. The Taíno believed in a balancing system of twin entities. As a Maya elder put it, “We live in a world of polarity — day and night, man and woman, positive and negative. Light and darkness need each other. They are a balance." 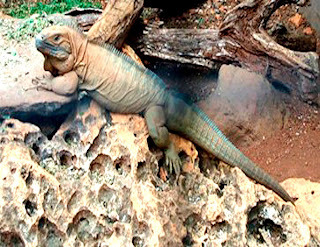 The Jamaican rock iguana with serrated back and sunned itself for acquiring body heat. It provided the Taíno a visual image for the sun. Liguanea from (La)-iguana is an area in St. Andrew, Jamaica. A “spittle” from inhaling the hallucinogenic, trance-producing cohoba dust was blown as snot on to the back of the intruding Deminán. It turned into a swelling from which Turtle Mother was born, not unlike Eve being created from Adam’s rib. Turtle Mother mated with the four brothers who fathered humankind. The Taíno told an arriving Spanish chronicler that an earlier cacique (ruler/chief) had seen the destruction of their civilization in a cohoba trance. They had then mistakenly believed that the destroyers were the Carib. Callaloo from the indigenous amaranth family. Jamaicans religiously eat callaloo as a vegetable. Maraca is a Taíno implement from the womb-like higuera “calabash” with fertilizing seeds in a white membrane. Dried, it represents the duality of a food container and musical instrument used in both the areito (dance) and in sacred ceremonies by a bohuti (shaman). Jerk (North American “jerky”), is from a Maya word for drying and preserving meat over a fire. The best jerk pork still comes from Boston Bay on the eastern tip of Jamaica. The meat is barbecued on a green pimento branch rack over a pimento wood fire. Maroons clandestinely traded jerk/barbecue meat to passing ships belonging to England’s enemies. 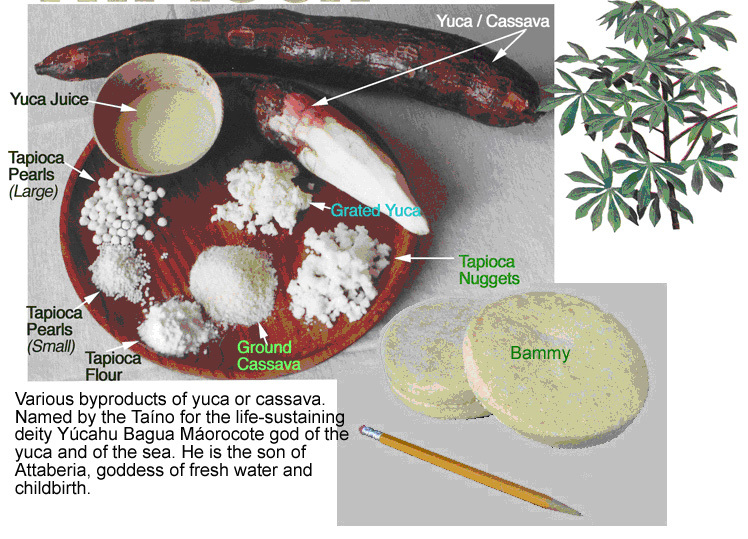 Cassava comes from cazabi, the Taíno large, flat, tropical mold-resistant tortilla-style bread made by grating the peeled root and squeezing out the cyanide based juice (used as a meat tenderizing casareep). It is then sun dried into a flour, sprinkled onto a burén, cooked to drive out any remaining cyanide, and placed on a thatch roof to sun-dry. The bread is sometimes stored for months without spoilage. According to the DICTIONARY OF JAMAICAN ENGLISH, Jamaicans call a thicker version of this pan bread, “bammy”, which is baked in a heavy iron mold. It may be the same as mbeiyú the Amerindian Tupi word for a flat manioc/yuca style cake. In the 1908 Maroon Medicine, a grill[ed] bammy with jerk pork was taken as provisions for a journey. Similar in concept to Jesus the Christ’s virgin birth from Mary and the seed of God/Yahweh. DNA tests for the BBC’s “Who do you think you are?” series revealed that “The Taíno mixed with [enslaved Africans] who had escaped from the Spanish and made their own ‘Maroon’ communities, so it's possible that Colin's remote ancestors were Maroons - or cimarrones (from the Spanish cima, or summit).” http://www.whodoyouthinkyouaremagazine.com/episode/colin-jackson. 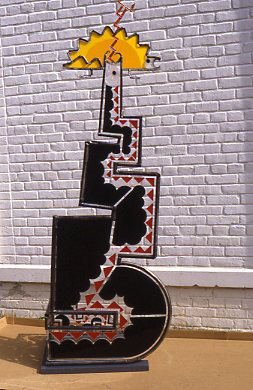 Mooretown Maroon informants used the word caban for the Taíno barbecoa grill made in the traditional indigenous American style platform for the meat supported by four “Y” shape legs driven into the ground over a fire. The grill made of green twigs could be lowered closer to the fire by circular strings that hung down from the 2 ½’ tall “Y”-shaped legs. Caban is Spanish for “cabin’, similar to barbecue that can also mean a platform. From the Taíno hamaca, a tropical American bed. One of the first Taíno space-saving technologies borrowed by Europeans for their ships. The English then made hammocks from canvas that seamen took with them on shore. Columbus met unfriendly Taíno in war canoas (Taíno canoe) on the North Coast on May 15, 1494 and later sailed around to its south coast where “There were many Indian villages near the Bay and where Columbus says he found the most intelligent and civilized aborigines of all he met in the Antilles. By means of an interpreter, he had the most interesting conversation with the cacique of a large village on a mountain slope, who together with his family and chief followers [nitaino], paid the Admiral a visit.” –The Story of Jamaica, Clinton V. Black, 26. Columbus’s description of the Taíno retinue, its regalia that included a feathered “Coat of Arms” is indicative of the traditional high level of Taíno governmental development. Jamaica, like that other large Caribbean islands, was divided into cacigazos or districts governed by caciques and a stratified collection of sub-cacique advisers, the Nitaino, or “Nobles” as the Spanish called them.